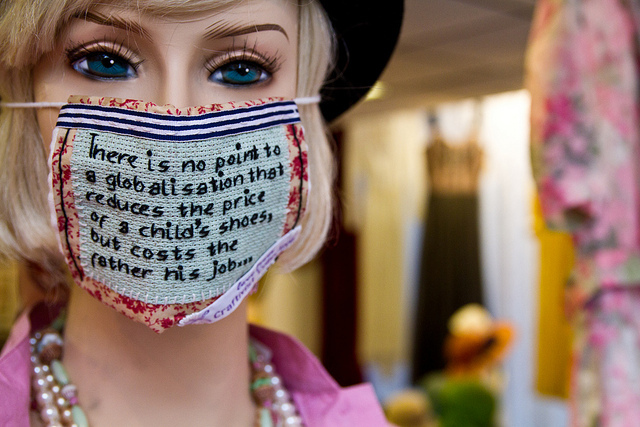 Ooo London Fashion Week starts today but whatever you do... Don't Mention The Garment Workers! Home / Worth writing about… / All / Ooo London Fashion Week starts today but whatever you do… Don’t Mention The Garment Workers! 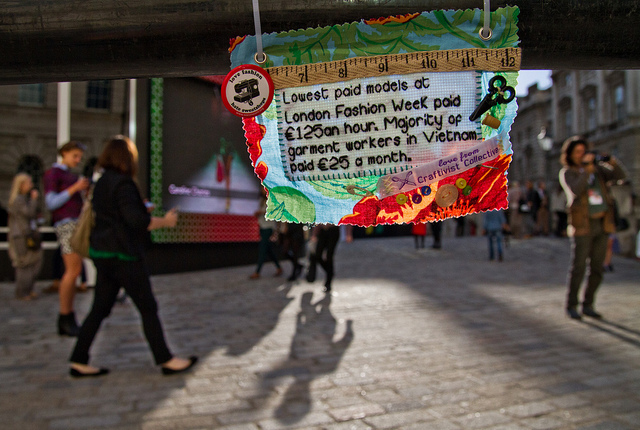 Ooo London Fashion Week starts today but whatever you do… Don’t Mention The Garment Workers! I have to admit that I stilllove reading Vogue cover to cover once a month on a day off. It’s a little treat & distraction to help me rest & look at beautiful images of clothes, shoes & bags (ooo bags…). Anyway, today is the first day of London Fashion Week. In many ways #LFW is a lovely reminder to all of us, wherever we are in the world, of how creative humans can be in creating stunning clothes, spectacular events and fantastical images. However, don’t you find it uncomfortable that the people who make clothes never receive a mention despite working long hours, with the majority (so sad to say) on poverty wages in unsafe conditions? I know I do. Look for the actual image on Twitter and elsewhere online now. Pretty provocative hey? What would you think if you spotted it walking through London as a fashion industry person? We love fashion but hate sweatshops, which is why we want London Fashion Week to celebrate style and creativity but also to discuss how the industry can stop exploitation. 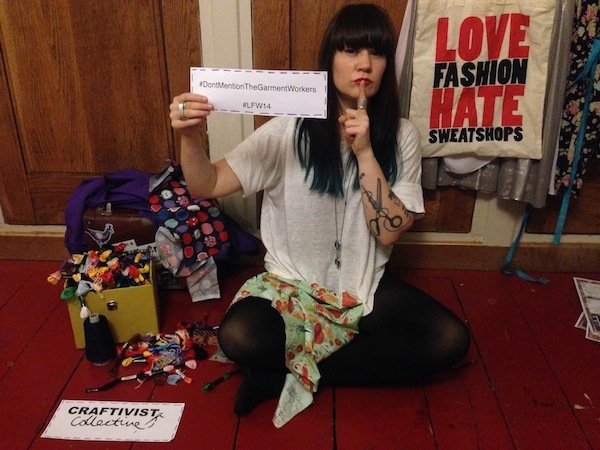 Us craftivists can help get the message out there too in 2 ways. A quick way is by sharing the image of the giant banner (find it online now) and of yourself like the below image on Facebook, Twitter, Instagram, Tumbler etc, to ensure garment workers aren’t forgotten but get the respect and dignity they deserve. 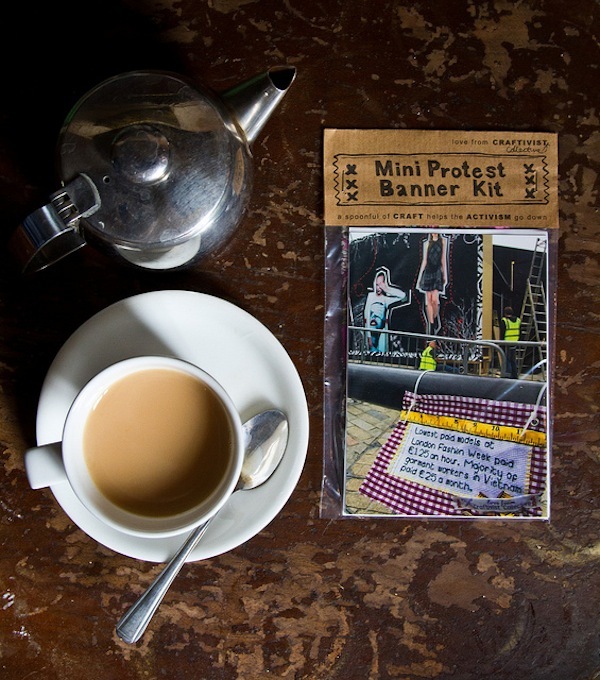 A craftivist way you can show solidarity with garment workers is to make one of our bespoke Mini Fashion Protest Banners and hang it on a shopping high street or mall never you wherever you are in the world. You can also share this on social media and we can retweet it etc too. 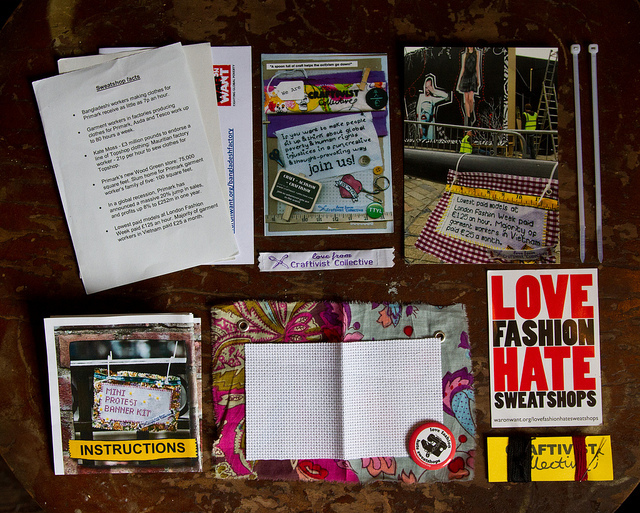 If you want to find out more about our way of doing craftivism, our book A Little Book of Craftivism is a great starting point. Buy here. We are a social enterprise so rely on your support to exist. If you like this post (we hope you do) then do share it with a friend you think might also like it (please).